Step 1: Money for Printing. Students are given "Print Cash" on their account each semester to be used for printing. Once you have used up your Print Cash, you must have Mountie Money to print. You can add Mountie Money to your card at the machine in the student union or online at the One Card Portal. Once you open your document or web page, select the Print option. Select "North Hall BW" for the black and white printer. Select "North Hall Color" for color printing. Note that the color printer defaults to double-sided printing. Click "OK". You will then be asked to enter your campus services ID. This is the first part of your email address. Once you have sent the job to printer, locate one of the black and white printers in the library. There are on 2 North. 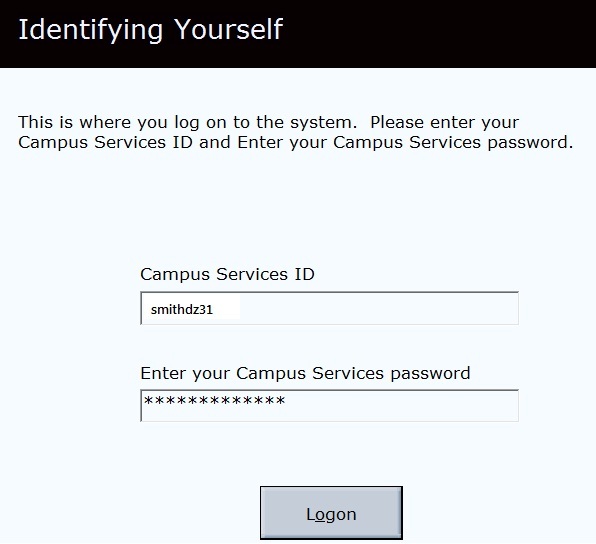 Enter your campus services ID and your D2L password to login. Select the job you want to print. What's my campus services ID? Use this when you send something to the printer, and when you log in at the printer. Community Users (not students) pay a different rate for printing. Stop by the Information Desk for more information. Yes! 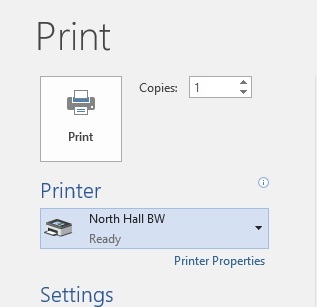 Select "North Hall Color" as your printer. The color printer is located on the 2 North Porch. Note that the color printer defaults to printing double sided. You can only print double sided on the color printer. Can I print on paper larger than 8x11? Yes, you can print on larger sizes at the color copier. Ask at the Information Desk for help. All printers are located on the 2 North Porch. Yes, community users can print for a small fee and must pay cash. Stop by the Information Desk for more information. Yes, you can print from your laptop or phone. Stop by the Information Desk for help if you need it.